Judy's workshop is an annual reminder for me about what really matters in schools: great stories, teachers who are passionate about books, and a good dose of humor. This is my first Judy Freeman seminar, and I NEVER want to miss one in the future! We need literature-based seminars now more than ever, as funding is being given to ISTEAM and away from our libraries. Every school in the state should have representative attend. This workshop is the highlight of my professional development all year! I always leave inspired and ready to implement lots of new ideas and book titles. I cannot live without my Judy Freeman seminar every year! You might think that 6 hours of listening to someone speak about children's books would get boring, but that is not true at all! I could listen to Judy talk about books for endless hours! Once again, I came away ready to make some great recommendation to my patrons! No matter how "on top" of kids lit I think I am, there is always so much to learn from Judy. I order most of her recommendations, and I use many of her lessons. It is such a fun, informative day. The amount of work put in is evident. The workshop inspired me with so many great book-related ideas to bring back to my school! This workshop is just enjoyable! If you love books, this is for you! I look forward to the workshop every year. If you are a librarian, teacher, public librarian, or just a lover of children's literature, this is the perfect workshop. Spending the day with Judy is magical! In a world so consumed by technology, it's a breath of fresh air to hear about 100+ great books! Always a wonderful workshop with tons of ideas to use in the classroom. When a teacher needs some motivation in the teaching field, Judy Freeman is just the person to reignite the passion for books! Thank you! This is my first year attending, and I already can't wait for next year! I loved hearing about so many different kinds of books and will be using the handbook to build my order for next school year! I also loved that you used a neighborhood bookstore as your vendor. I take my daughter to The Curious Reader for their Saturday storytimes! Every year Judy's pick help me further develop my library's collection with diverse picks I may have otherwise missed. It takes a village, and Judy's workshop is a huge help to make sure I am exposing my students to the best books out there. I liked the tie-ins with other books. I enjoyed the projects associated with the titles. The handbook is extremely useful! Judy's passion about books and reading is infectious. I leave this workshop feeling so inspired with so many ideas. Brilliant use of books with tie-ins. Judy is wonderfully entertaining. I recommend her highly. This is a great workshop. I learned many ideas and activities to do with my class. Judy is so knowledgeable and entertaining, I can't wait for next year's workshop. I am a retired middle school teacher and now solely at the public library. I have been coming to Winners! for over 15 years (probably closer to 20). I patiently wait for May each year with great anticipation. Now I can spend my social security money on books, but to me the purchase of a book is an investment in all the children I will share it with. I always enjoy learning about books that have not been on anyone's radar. These treasures make my library a place where students will be sure to find hidden gems that make their library experience more special! I thought there were many excellent suggestions that I can use in storytime at the library. I thought the program was very valuable. Thank you for recharging my book passion batteries once again! Great! My1st time. Now I have excellent book club title choices and other after-school/ evening program ideas that revolve around topics! I love children's books, so this workshop was like a day in a candy shop! So many chocolates! So many sweets! I can't wait to share with my kiddos and my colleagues! It was also wonderful to have the books available for purchase. Thank you. This conference was so informative and the handbook with tools to add to my tool kit is invaluable. Judy, you help me so much with collection development. A definite shortcut to purchasing wonderful books! Thank you! As a classroom teacher, I love props, ideas on how to make the props, where to buy them, or stories that would benefit from them. I love your songs and guitar, too. I love all the ideas. This conference helps me remember that I have the power to make kids love reading. I love the interdisciplinary connections, as well as the related resources. It is great to have a variety of reading levels available to teach a similar topic to multiple grade levels. I enjoyed starting with the reader's theater to connect with other attendees. It was all-together educational and fun. This is my first time attending, and I won't miss it again. Very informative & engaging. Thanks. In an age of Lucy Calkins, it's great to put the fun back into reading books! Libraries are the last haven for reading for the joy of it! As always, after one of Judy's workshops, I go back to work re-energized and rejuvenated, full of fun educational iseas to use for the last few weeks of school. This summer, I will use the ideas to plan wonderful lessons for next year! This was my 1st time attending Winners, and I absolutely loved it! I'm feeling very inspired and excited to use so many of the amazing books and ideas I learned about today! Thank you! I love all of the project ideas used in classrooms and all of the examples! I can't wait to use them! My 1st Winners Workshop as a "bookhead." I loved learning about all the great new books. There was so much info in this great workshop. Thanks, Judy. I can't wait to finish the school year using some of Judy's suggestions on books and activities that enrich our curriculum. What a fun, educational, and creative time my students and I are going to have! I am going to take my books that I bought today and Judy's Handbook back to school to share with my colleagues. This is my first Professional Development workshop, and I am so glad it was this one! This was fabulous! Thanks so much. This workshop is wonderful. I love spending an entire day immersed in exploring children's books. It is also beneficial in preparing booklists for summer reading and providing me with content for readers' advisory year round. Thank you. The most information at one workshop I've ever experienced. Loved it! This is my favorite day of my school year. I learn so much--and I love to take what I learned & share it with my teachers and students. I truly hope that Judy & her team are able to continue to present Winners! I would be lost without it! Thank you! I look forward to this day all year! So many great ideas. Especially love the Reader's Theater Scripts. Thanks for all your hard work! Judy, Judy, Judy--What would I do without you? You revitalize me. You remind me how important I am (librarians) to children--because I AM the tie to READ. Please, please, please come back for #35. WOW! Now I know why I have heard others say that I should get to Winners! A highlight of the year. The books and Judy are WINNERS! How wonderful! Each year, I want to see what Judy has found-- and expanded on so magnificently! Thank you. Thank you for sharing all these terrific books with us. I use this information to put great story books into students' and teachers' hands and to supplement our science, art, and history instruction. Judy never disappoints! In this day and age when technology and testing are taking center stage, Judy reminds me of the importance of reading and the impact books have on lifelong learning. Many thanks for this lively and energizing seminar. Each time I see a wide-mouthed smile on a child returning a book to the library that I have recommended, I have a wide-mouthed smile remembering your commentary on the books. Thanks for many wide-mouthed smiles. Really wonderful books and ideas!! Inspiring and motivating. By the end of school, "red tape" can get you down. Thanks for ligting us up again! Looking forward to using the many suggestions given today. Great day, well worth the time out of school! Best professional development of the year. First time here for me and loved every minute of it! Learned so much I can use in my 4th grade class. Spent too much on new books!! Will definitely be back next year. Thank you, Judy! Just loved the day. Left with a long list of books to buy! The most indulgent, pleasurable work day every time! Entertaining and educating always! Thank you so much. Always so creative and inspiring to see what Judy sees in books. Thank you for all the work you've done. Brava!! My mom brought me when I was a first year teacher, and I've been coming every since! I look forward to this day each year. I love the stories, the songs, the reader's theater scripts, and the handbook. No one does it better than Judy Freeman. I hope you never retire! This workshop is so helpful! It is so refreshing and reminds me how much I love my job. Here're my comments for the day--and they come in fours! Nicely paced. Great energy. Dynamic. Wonderful Blend. Wonderful workshop! This was my first time attending, and I am excited to use Judy Freeman's ideas for my instruction. After a few years with budget issues, we were finally allowed to return to Winners! We missed Judy and her wonderful ideas and energy. I am always inspired by Judy Freeman. I leave every year feeling energized about my program, excited to purchase new books, and to put all Judy's germ ideas to use, Never retire, Judy! Thank you for another wonderful workshop! I return to Bookmates with lots of great books plus fun activities and songs! Your enthusiasm is addictive! I love Judy's workshop! I look forward to attending this workshop every year. I try to order most of the suggested titles. I give a presentation to my colleagues and hopefully get them just as excited as I am about books! I have been coming to Winners year after year since the Alice Yucht days and just enjoy the workshop and seeing (and buying) the books. It is a great way to see so many books so I can order for my school. Thanks for another great year! Thank you, Judy, for all your hard work each year! You make my job easier and my ordering simpler and defensible. Thank you! My favorite day of the year! Each year your book becomes my "bible" for the year, filled with reveiews along with so many activities to go along with them. Can't wait until next year. I like learning about new books, of course, but I also like being inspired to return to my school with new energy and new ideas so I can teach better than before. I've been to several Judy Freeman Winners! workshops over the years. She never disappoints! Her list is comprehensive and well-researched. The lesson plans/discussion points/activities are a valuable resource. I look forward to this workshop each year...Excellent professional development! Thank you for validating what I do and acknowledging the value of books and stories. This workshop is like a shot of "you go, girl." My budget is so low, I would never see all these great books without you. I must pick just a few of the very best, and you really support my work. I have been a consecutive attendee for nearly 15 years (minus flood year!) and look forward to this day every year. Judy's knowledge of books, presentation skills, familiarity with GS standards, understanding of climate in our schools, humor, is, well, there's no equal! Thanks! I was very happy to see so many people in attendance! Judy was amazing, as usual. Attendance each year always sparks my imagination and inner author who is just waiting to burst out. I loved the selection of 4-6 grade books. Thank you! I just ordered your new Storytelling book. Can't wait to see it. I always leave feeling refreshed, energized, and excited. I want to be you when I grow young! I work in coal county Pennsylvania in an underserved community. It is a book desert. This program is my oasis! You help me help the children who need it the most. I love how Judy mixes in humorous slides and stories with all the material! There is so much information which is great, but it's nice to break it up a bit. You have to keep doing Winners! So much appreciate Judy's support for teaching and our profession! We really need this! Of course, Judy always re-stimulates my passion for the best job ever- Children's Librarian! Don't cancel Winners! This is the single best education in-service I have ever attended! Judy gives new insight into children's books. She helps point out lessons and activities that educators may not have thought of before to tie in to books. Absolutely should have this every year! It is a wealth of information so valuable to all in early education. Best day ever! Hope to be back. Can't wait to read as many of these wonderful books as I can and share share share them with my students and colleagues. Ten year attendee and look forward to it all year! Truly love the "discussion points" included in some Germs. Definitely connected to Danielson Evaluation Tool and Common Core. I look forward each year to Judy's funny, insightful, inspiring, and personal look at the year's books and her amazing suggestions of what we can do with them. Whether I have already read them or am hearing them for the first time, Judy's read-aloud excerpts bring them vividly to life and make me a better librarian. I can't imagine a year without Winners! This is my first year as a Media Specialist, and this workshop was amazing! So many wonderful books and ideas. I can't wait to put them to use. I am retiring this year, but I could not resist one more year enjoying and learning from Judy Freeman. It is her annual workshop that took a new elementary school librarian and turned her into one well-versed in the books for her students. The highlight of the year for professional development. Provides information that I use throughout the year- presented in a fun way! I take my cues from Judy when I'm booktalking or just doing Reader's Advisory....and hundreds of kids are the beneficiaries. Fantastic. Thank you! Most all-day workshops have you tired before lunch. Judy Freeman's dynamic and audience participatory workshop guarantees many nuggets of knowledge all day long. I have been coming to Winners since Judy's last year with Alice Yucht and would not miss this. So many new ideas, songs, and lessons. Thank you for the book and all the hard work that goes into this day! I have been coming to Winners for many years! You are one in a million. I use your suggestions for teaching, your gifts to us, and your knowledge. All your hard work is appreciated! Thank you for continuing to provide such a wonderful workshop filled with so much I can bring back to school and use with my students right away. You always introduce me to books that I haven't seen before attending your workshop. Wonderful inspiration from this day! So helpful to have a selection of books and activities. It helps to break through the overwhelming number of books available. I have been attending this workshop for years. I wouldn't miss it! We use these books throughout our classes and to advise our parents, as well. Love the follow-up activities in response to the books. 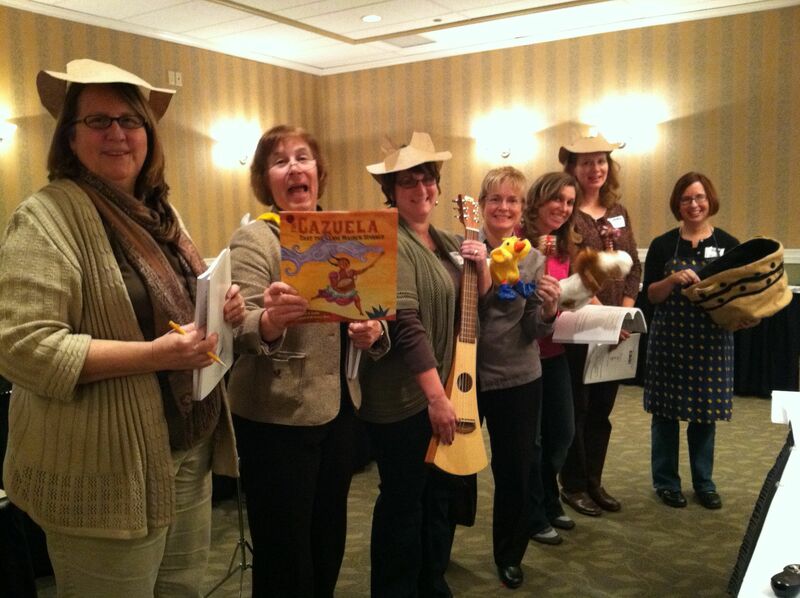 Judy Freeman's entertaining and lively workshop brought many books to life! Her enthusiasm about reading and books is contagious! Love all the interactive examples and Judy's contagious enthusiasm for children's literature! Bravo! Thanks, Judy, for once again recharging my "teaching battery." I look forward to sprinkling some of your magical reading pixie dust among my readers. Thank you for all the choices for Middle readers and even a few YA! This was my first "Judy Freeman" workshop, and I enjoyed it tremendously! I read book reviews and order the books, but I am so busy with my lesson planning, computer issues, and juggling 39 volunteers that I have little time to read/explore the new books I've ordered! I also got some great ideas and some innovative ways to do things! I have had the pleasure of attending almost a decade's worth of Judy Freeman's workshops. There has not been one year where I haven't left without a dozen activities that I can use in my classroom the very next day. Such a delight to experience the joy of books and great stories. Quite a change from the push for librarians to be only technologists. So many schools are forgetting that the word librarian comes from "librus"- book. A wonderful day! So inspirational! Beautiful day that took me to amazingly wonderful places!! You are still so inspirational and have loads of enthusiasm and energy! Thanks for all your insights and for doing the "heavy lifting" with all your books for us when we teachers don't have the time. Extremely valuable for Language Arts teachers and librarians! Hope to see you again next year! After returning to reaching after taking off to raise 3 kids, Winners is such a wonderful resource! I have been coming to Judy's workshop for years, and they just keep getting better! Her enthusiasm recharges me and makes me want to become better at my craft! At least for a day, the drudgery education can sometimes become slips away, and I go home remembering why I went into this field in the first place. I can't wait to get back to school using these books! Judy really brings the books to life and makes us believe we can use them to spread a love of reading to our students. Thank you! Judy, waiting for next year is not easy! You are my star! Thank you. Highlight of my year. Calling ALL reading specialist, librarians, literacy coaches, and elementary teachers! As a long time teacher but first year librarian, this workshop provided me with a vast array of ideas to bring back to the library and truly have the kids engaged. I look forward to this each year! Winners is so helpful when choosing books and creating lesson plans. My kids love Reader's Theater. I love coming to this workshop! Judy is so energetic! She inspires me to be a better librarian. I am always impressed by the quality of Judy's presentation and the venues. It took me 2 1/2 hours to drive here today-- and it was worth every minute! Judy rocks! Your workshop recharges me! I always come away from the workshop with tons of great ideas to share with my students and teachers. Purred like a cat...Sped like a train....Roared like a tiger....Aahed like a frog....What a magical event with our beloved Judy Freeman. Bravo! For the past 10 years, you have never disappointed us. I will arrive at school tomorrow rejuvenated and ready to head into the home stretch of the school year with tons of great, new, practical ideas. Thanks for the inspiration! This is my favorite workshop of the year. I love the fact that I can leave with the actual books (from Books, Bytes, & Beyond), and have ideas on how to use them in the library. Long live The Winners! Workshop. It was a pleasure to hear reviews of the best books and get ideas for lessons. I felt like I was really swallowed up into the books and how to read and experience them. Love, love, love spending a day with Judy and all these wonderful books! Better than chocolate! Love that it is all in the handbook. The workshop was wonderful. Judy's endless energy, terrifically expressive voices, and obvious joy in her work made the day. Thank you! I attend Winners year after year. How could you not? Every year we are all treated to a day with books--nothing better. Judy gives us practical next day ways to use all sorts of books. We are luck to learn about infusing books into the Common Core. Just as the saying was: NJ and you, perfect together...Judy and Books, perfect forever! As a first-year attendee of Winners, I was very impressed. The handbook is unbelievable, with many ideas. The presentation illuminated the content of the handbook. I'll be sure to attend in future years. Excellent workshop! After attending Winners over the last few years, I know Ms Freeman's conference has clearly established itself as "the library of professionals." An excellent resource. The lessons taught during Winners! will help nurture students' love of reading. I love the music and variety of book descriptions! Judy's love of life is contagious! A very well-organized and informative seminar. It is amazing how much Judy can present to her audience in just one day! Thank you for another inspiring day. I had my Titlewave app open and created my PO during this workshop. Your handbook creates my lesson plans, too! I may have time to read this summer! Great as always! The student projects were excellent examples. I liked that they could be adapted to not only different grades but could also be applied to different subject areas. Fantastic tools shown to align with current curriculum! Judy, you "knocked it out of the park" this year! Thanks. Such a great day -- wish it could go on! I can't imagine a better way to get a handle on a year's worth of wonderful books and how to enhance their presentation to children. Judy Freeman's enthusiasm for books is infectious. Hoping to carry that enthusiasm back to my students to inspire them in the same way that she inspired me. In spite of all the educational nonsense going on these days which seems to crush any enthusiasm in teachers, Judy's workshop reignites an excitement for books which had seemed to be lost. I can't believe anyone leaves a presentation by Judy not revitalized and excited once again about sharing books. Judy Freeman is an inspiration! Some of my (okay, a lot of my) favorite lessons that I teach come from Judy's workshops! I have been a devotee of this workshop for 15 years. I rely on Judy's suggestions to guide our purchases and to aim me toward awesome books for kids and teachers. 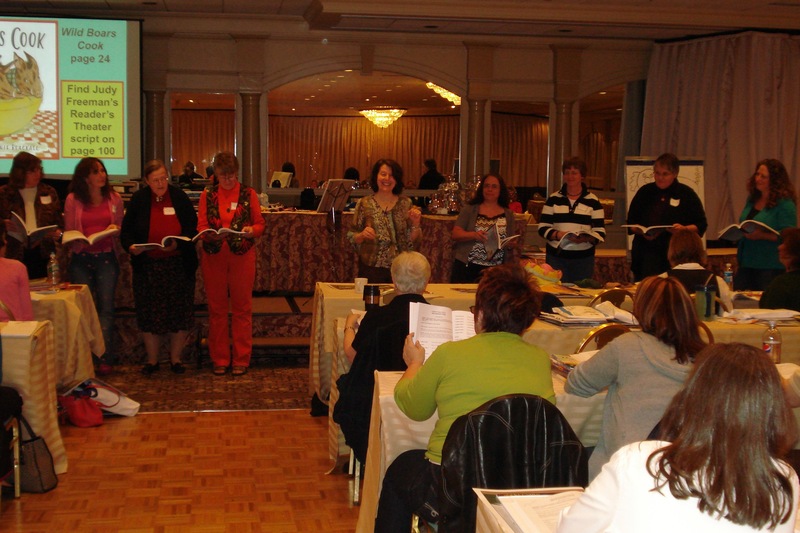 Judy's Winners Workshop is a must for anyone who teaches. It's my favorite workshop to attend because I get ideas I can incorporate the next day. In today's world of education, this workshop always shows me how to connect books to the curriculum (this year--the core curriculum). Judy's enthusiasm for quality children's literature is contagious. I appreciate her honest evaluation of the newest books in print. Follow-up activity suggestions are wonderful and easy to implement in the classroom. My first Winners Workshop--Absolutely the best! So many good books--so many good ideas! Can't wait to use them in my library lessons. Loved it again! This is my tenth year coming to the Winners! Workshop. Even when it can't be funded by school, it's worth every penny of my own money to attend the workshop! Thanks again, Judy and your crew for sharing and inspiring. Books are positively powerful when shared aloud! Great ideas. Loved Judy's enthusiasm, experience, and expertise. Loved that you could buy the books that she discussed during the workshop from Owl Books. I LOVE this workshop! It is my annual dose of uplifting and encouragement. The only problem is I spend too much money because I cannot wait to own the books. Judy makes them all sound so wonderful. We love Judy! This is always my favorite workshop of the year. Thank you for another fantastic Winners! Judy "wowed" us again. This was my 20th year. Judy never disappoints! Best workshop I attend all year! Content drives my decisions about collection development for K-8 since I manage 2 libraries covering 13 grade levels. Including Common Core input is such a help since we all have to take this into consideration. Invaluable input for "stretched" librarians! This workshop truly helps me decide what to purchase for my library. I have been paying out of my own pocket for the past 3 years. It's invaluable! Excellent! Such fun & so useful to talk books and how to use them, as opposed to the "edu-babble" that surrounds us. This is what politicians have no clue about. I miss books! All my attention has been on the CCS. I have forgotten the true magic of a REAL book. This workshop transported me back to 1st grade and my love of a NEW book. Going to a Judy Freeman Workshop always gives me the boost I need (and the ideas I need) to end the school year with the same BANG as I began it! By this time of year, the books are getting tired to me. Winners re-motivates me to get back into using books again. I get vitalized and energized by Judy. Thank you. "Judy reads books" and Judy works hard! So appreciative of this day as an opportunity to hear Judy's reviews and network with colleagues...So important! Thank you. Thank you, Thank you, Thank you! Always a pleasure. Hoping this can continue on...You are an inspiration!! As a public children's librarian, Judy's workshop has given me new insights on using books and mini-book talks to reach my patrons. Judy, you're fabulous--at the top of your game!! I haven't been able to attend for the past couple of years. I truly missed it. As always, Judy's passion and expertise are invigorating. Another FABULOUS conference, Judy. Thanks for introducing me to a few "must haves" and providing a whole buffet of wonderful ideas to inspire all of my readers. Awesome as always! Can't wait for #30. As I tell my admins, Judy Freeman is my Librarian Idol! Wonderful workshop! Judy provided so many great details and background info for many amazing books. The handbook is an awesome reference guide. Judy was enthusiastic and entertaining! I look forward to reading many of her favorite picks! I have been coming to see Judy for years (early 90s). I also love your songs! Please continue to bring us your wonderful workshop. You always inspire me. Gets better every year! Love the complete lesson plans this time. Judy Freeman is the BEST at what she does. The workshops are always interesting. Winners is a great tool. I've incorporated many activities from the handbook and workshop into my library program. Just a thank you for your passion and creativity. Thank you so much for your time and dedication to helping us reach children through a love of books and reading. You are an inspirational shot in the arm for all of us. I look forward to your Winners workshop every year - it is the lifeblood of my program. To my way of thinking if you were to just publish the book it wouldn't have the same impact or effect - actually seeing the book and hearing you read parts of it is the best. Although I read reviews and get a ton of great books throughout the year, I always look forward to your recommendations and your handbook is my bible! I have been coming to Winners since the Alice days. Fortunately, my district is supportive of me and this workshop. Winners is the only workshop I attend and I look forward to it every year. Many of your songs and activities have added so much to my own classroom. Thank you for all the wonderful years that I have attended your seminars. I feel like I know you personally and you have made a great impact on the way I have become an enthusiastic storyteller. Your workshop has been so helpful in that I can see these great books and pick out the ones I know will circulate, and that way I get the good ones without over ordering. Plus your wonderful presentation helps me know the books without reading every single one of them, not to mention the fantastic presentation ideas. You have no idea how much you�ve influenced my library instruction, let alone all the wonderful book purchases I�ve made due to your presentation and handbook. In this time of technology, glogs, blogs, QRs, etc. (not that there is anything wrong with them), I think we really need to hear your passion for books. You do that which no one else does. My day with you is the genesis of my book order for the following year. And as I slog through some of these very long days, you are the event to which I hold out hope; we�re getting close to the end of another busy and fulfilling year. Suddenly, after our seminar together I am refreshed and rejuvenated, and I can�t wait to place a book order so that I can share the wonderful new materials with our students the following year. I have spent a day where I feel valued for my career choice. Have I remember to say �thank you�? You really do give me new inspiration each year and I have used your suggestions countless times in my first grade classroom. You have worked so hard on Winners for so many years and it has been a joy for me for every year that I have attended. I could tell you over and over again how valuable Winners has been to me. It has reached the point where I don't trust any of the other BEST lists but I always trust yours. I come to your workshop for your presentation. It is just fabulous. You have made me a better librarian. My story times have really come alive with your ideas. The presentation is what stays with me. I gleaned so many valuable lesson ideas from your seminar that I wouldn�t dream of missing it! I have looked forward to this program every year, as my birthday gift to myself. I love your Winners program. It is so informative and your enthusiasm carries me throughout the year. You give me so many ideas for booktalking and for doing my job as a librarian. You are the answer to �how many ways can you enjoy a book?� The Winners Workshop is one of those valuable tools for keeping us psyched about our jobs and for using books in creative ways. have always admired your enthusiasm, your spirit and your energy. I loved you as a teacher, as a matter of fact. I believe your course was one of my best at Pratt. Winners is a great program. I am always happy to listen to your suggestions and see how you engage your audience. It is important to be able to communicate with one another. Let me just say that I�ve been coming to your workshops for 22 years and use your Winners as the basis for my curriculum. I have always been amazed at your enthusiasm for this workshop and have heard you say many times that it's your favorite - ours too!!! Your books are a fantastic resource (which we use constantly) but the presentation is one-of-a-kind. There is just no one like you out there!